I previously reviewed the Vanguard and the Divemaster and both have been great watches. Gruppo Gamma has just re-released the Chrononaut. The Chrononaut was made before, as a limited edition, but now its back by popular demand and I am happy to get a hold of one to review. So what is a Chrononaut? A chrononaut is a time traveler. If you are a traveler like me you do travel through time, or at least through time zones. The Gruppo Gamma Chrononaut helps us chrononauts by using a rotatable chapter ring which is used to mark a second time zone. The dial on the Chrononaut is a simple three hander but can be used as a GMT with the use of a rotating chapter ring. The vintage green color of the lume painted on the hour numbers and markers look great against the matte black finish with the only standout color on red seconds hand. The look of this dial is very clean and simple, but not boring. There is the same vintage lume used on the rotating chapter ring. The rotating chapter ring tapers down to the face of the dial which adds nice dimension to the dial. Covering all of this is a very thick sapphire crystal. The lume on the Gruppo Gamma Chrononaut is SuperLuminova. This SuperLuminova is painted on all the hands, numbers, and markers on both the face of the dial, and on the rotating chapter ring. The lume charges very quick and lasts a good amount of time and really looks great though that thick sapphire crystal. The case on the Gruppo Gamma Chrononaut is made from brushed stainless steel and measures in at 42mm wide, and 14mm thick. Almost the entire case has a brushed finish with the exception of the lower part of the bezel which is polished. There are two screw down crowns, one for adjusting the time, and the other for rotating the chapter ring. The back has a screw down exhibition case back which shows the Swiss movement inside. Protecting the dial on this case is a very thick sapphire crystal which protrudes well above the bezel. Water resistance on this is a very respectable 300meter or 1000ft. For the Chrononaut, Gruppo Gamma has chosen a Swiss STP1-11 automatic movement with a 44 hour power reserve. This is their only model with a Swiss movement and I really like the look of it. The rotor is signed and decorated with Côtes de Genève and the rest of the movement is decorated with perlage. Accuracy is rated between -0 to +15 s/ day. The Gruppo Gamma Chrononaut comes with two straps. The strap pictured above is the black tropic rubber with singed buckle. The second strap is a green canvas strap with singed buckle. The rubber strap is comfortable right out of the box and fits the wrist very well. The canvas strap takes a little work to get comfortable. It starts out very stiff but with bending and rolling it starts to soften up and conforms well to the wrist. Both straps look great and each give the watch a completely different look. The green from the canvas strap really bring out the green lume on the dial where the black from the rubber strap bring out the black from the dial. Gruppo Gamma makes some great tool watches for casual wear. This Chrononaut has a nice clean and subtle look which I would feel comfortable with in the office. It’s great for travelers or anyone needing to track a second time zone. The finish is very well done with no flaws found. This watch is selling right now on their site for $650 USD and I feel that a pretty good price for a watch of this quality and the fact that it has a Swiss movement. 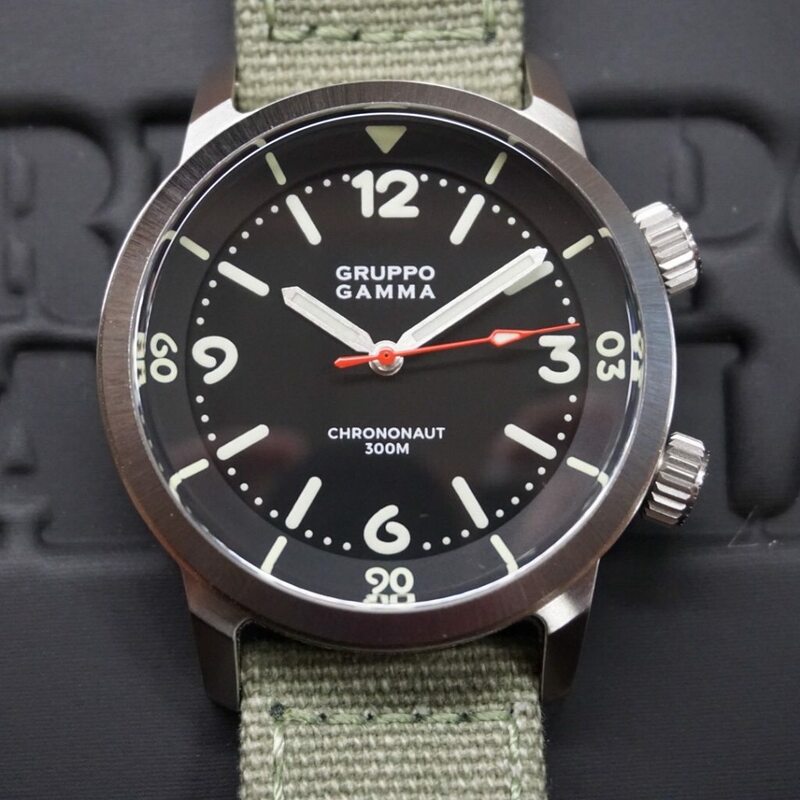 You can check the out at Gruppogammawatches.com. The best thing about it: Inner rotating chapter ring. Measurements: 42mm wide, 50mm lug to lug, and 14mm thick including crystal.